Break up the flight: This may sound like the worst idea ever, but if the trip is 4+ hours, I would recommend it. Not a long layover, of course. Our 45-minute layover let me stretch my legs and let Baby Girl get some wiggles out. And I got to change that terrible diaper on the ground instead of the air. Thank you. Time the flight according to his/her sleep schedule: Every time we’ve flown with Baby Girl, we’ve done it either in the morning when she should be asleep or at night just as she should be going to bed. She’s slept over half the flight every time. Pajamas on board? Check! 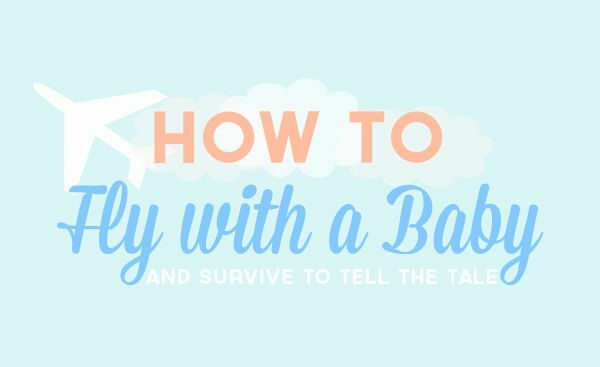 Nurse or bottle feed during take off and landing: Our pediatrician gave us this advice, and it helped keep Baby Girl calm during those more turbulent moments. And the swallowing helped her ears to “pop” and adjust to the change in pressure. Thanks to this tip, take off and landing were stress-free. Can I get a Hallelujah? (Also, a pacifier might work, too, though we never tried it. Sit in the back: Sans baby, we would avoid the back of the plane. But hear me out. You’re close to the bathroom, and it’s where all the other parents with babies sit, so it’s just one big baby fest back there. Especially on empty flights where everyone else was sitting in the front, we felt no stress (well, less stress) when Baby Girl started getting loud and grumpy. Bring reinforcements: Here are a few necessities: food for you and the baby (or a nursing cover, if that’s the baby’s food of choice); the stroller (and check it at the gate! ); a change of clothes (or two); plenty of diapers and wipes; toys; proof of age (if the baby’s under two); and baby Tylenol, just in case. Remember that it’s just a few hours: This thought is all that got me through the flight sans husband. When I’d been holding my legs perfectly still for over an hour so Baby Girl could nap on them, or when I’d walked through the aisle with baby and cat and banged against almost every shoulder and seat-back I passed, I just reminded myself that it would soon be over. I bow to you. Amazing work, Joanna! A friend of mine told me how she had to fly with her small children (all under 6) across country by herself. On the way to the airport, two of the kids got carsick and puked all over everyone. She had to change their clothes in the airport, still covered in eau de puke, and get on the plane. She told me that and I was like, no, nope, nope, no. Never flying with my kids by myself. Thanks, Roo! I’m pretty sure taking care of three little girls each day is harder than my one solo flight with our girl, so kudos to you, too! I’ve realized that when flying, you just have to accept that you’re at the mercy of Murphy’s Law. On one of our flights, our girl had two blowouts within an hour. That never happens on the ground, but of course it happened at 30,000 feet. Great tips. We’ve flown with our kids when they were babies and you can never prepare enough. I’ve also found that most people on a flight understand when flying with babies and forgiving. I think what also affects the flight is where you’re going. We travel Chicago to San Diego once a year and there are a ton of kids so not a big deal. Flying to Atlanta or Rochester, NY that’s a different cast of characters. Bottom line is that you get a little more slack flying to destinations that bring families (i.e. Orlando). Great job flying by yourself and the baby. It’s no easy job. Where you’re flying is probably a big factor… good point! 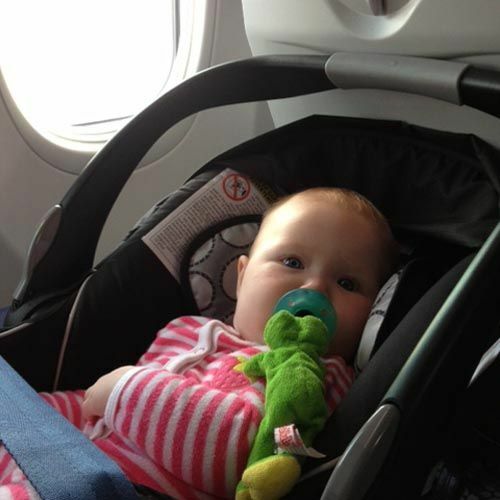 And I was surprised by how nice everyone was on the flights I’ve been on with our girl. I hope I was that understanding about babies before i had one of my own! We are getting ready to take out little guy to Ireland at the end of September. Going over we aren’t really worried at all since it is an overnight flight. Coming back? We will see how that works out. So far in his 8 flights he has been a good sport about the entire the time. In the end, if someone wants to complain about having a kid on a plane and the kid having a melt down they need to remember; an airplane really is nothing more than a flying bus. Your tickets are cheap(ish) because babies are allowed to fly. If you don’t like it, spend more money and charter a plane yourself. There are two kinds of people who fly with children: (1) those who go out of their way to minimize their kids’ ability to bother others, and (2) those who couldn’t care less about their fellow passengers. It’s the folks in the second category that make all travelers want to be seated as far away from young children as possible. Yeah, I know it’s not always possible to comfort an infant/baby/toddler in an airplane, but as a parent/guardian it’s your responsibility to at least try. If I’m seated near a family with a kid who’s having a meltdown despite the best efforts of the parents, I’ll grit my teeth and tolerate it. However, if the parents aren’t making the slightest effort to try to comfort the kid or curtail disruptive behaviors (screeching, kicking seats, etc) I will not hesitate to speak up (to the parents). One should be able to expect some minimum level of common courtesy from fellow passengers on an airplane, without having to resort to hiring a private charter. I 100% agree with what you are saying. I was making the assumption that the parents were trying to take care of their kids. It is case number 2 that drives me nuts and I don’t understand how those people think it is ok to behave that way. Of course speaking up to the parents probably won’t really do much, since they obviously don’t care already. In fact it may make things worse and you would probably get a “don’t tell me how to raise me kids” kind of response. I’ve spoken up a few times in the past, with mixed results. Sometimes it makes no difference, as you suspected. Fortunately I haven’t been in a situation where it made things worse (knock on wood). But in other cases it does result in some improvement. One incident I can remember in particular involved a young child relentlessly kicking the back of my seat for the first 15 minutes of a flight. When it became apparent that the adult wasn’t going to do anything about it, I spoke directly to her and asked that she attempt to get the behavior to stop. I could tell she wasn’t happy with me, and some of her later comments toward the child about its behavior were actually directed toward me. But for the rest of the flight, I didn’t have more than the occasional kick in the back of my seat. I’ll exchange dirty looks and sarcastic comments from an adult over hours of seat-kicking every time. Totally with you on that one – I’ve just come back from the states (I live in France) so had a 9 hour flight with 2 babies. I thought uh oh, babies for an overnight flight? Could go either way. The 1st baby was absolutely fine, slept most of the flight and as soon as he would wake up the parents played games with him or rocked him in the aisles. They went out of their way to stop him being a bother. 2nd baby? Total opposite. Screamed the entire flight while parents were watching tv and pretending not to notice. In the end even the stewards started to complain although it didn’t change anything. That’s when you want to hit someone! I’ve never understood the “parenting by not parenting” method. Kids will be kids, but they also need parents that help them learn how to behave in public. Good luck on your Ireland trip, Brian! That will be quite the adventure. Your little guy will look back on pictures from that trip and think they’re the coolest ever, so take lots of them with that snazzy camera of yours! For longer flights (bigger aircrafts), you might be able to reserve the bulkhead seats where they can attach bassinets to wall in front (only for babies under 20 lbs I think). 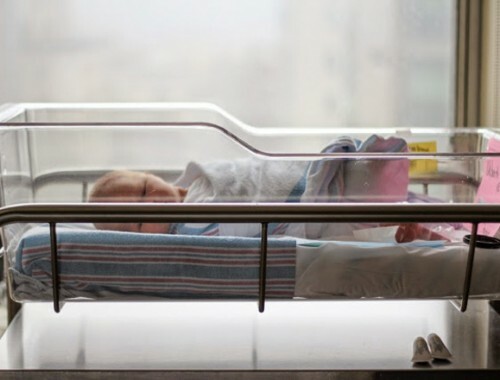 Even if your baby is not bassinet eligible, the bulkheads have more legroom/space and you are closer to the washrooms. My wife managed to do a 14 hour flight (yikes!) by herself (double yikes!!) – lol, thats 2 rules broken on one flight. 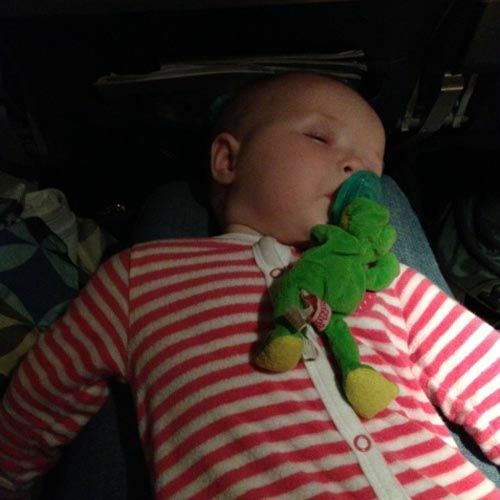 Our baby has been on 8 flights so far( before she turned 1), and it has generally been a good experience for us and our fellow passengers :). Good to know, Nitin! Your wife is a superwoman to do a flight that long by herself. I think it’s great to see new parents who don’t let babies keep them from the trips they would normally go on, so props to both of you! The only tip I would add to your list is to try and leave getting on the plane until the last moment. While those with children often get called on first, we hang back so that our little chap spends as little time in a confined space as possible. We often get folk suggesting we move up the line but always politely decline as it’s in everyone’s best interests! And that’s a great tip for flying with a little one. Once our girl realizes she has to sit still, she gets more wiggly than ever. Minimizing that time in the cabin is a great idea! We have a 1 year old and we have not been on the plane with him yet. I’m not a big fan of air travel and adding a baby into the mix does not sound appealing at all! I know you HAD to do this for the move though and it seems to have worked out OK. We are also staying away from the restaurants for the same reasons plus I am sure it’s annoying to the other guests as well, even though they would all say “cute baby” first. Good for the Restaurant Spending totals in Mint anyway. 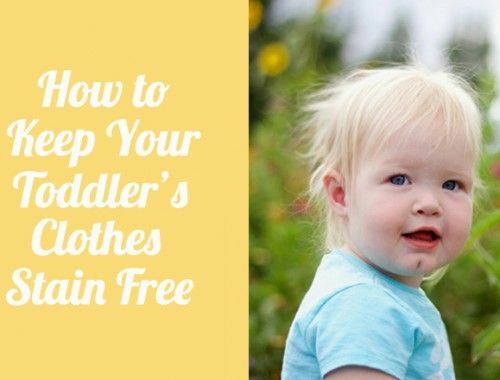 I love reading other parent’s tips. My daughter is 23 months and I have flown 30+ times SOLO with her at this point due to living cross-country from our families. That being said, I WISH I was flying with a baby and not a toddler. It was so much easier before she was mobile. Now, I pack lots of snacks, new books, stickers, and technology to try to keep her entertained on our 6 hours in air and more of travel. These are great tips, Joanna. 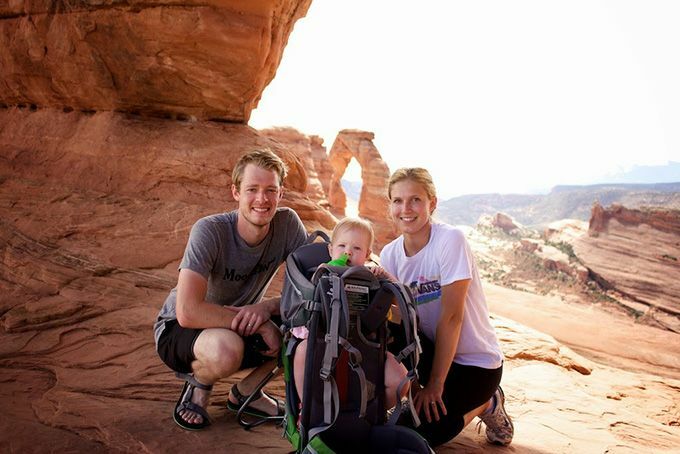 Traveling with a child can be a hassle, and flying is an even bigger and more daunting task for new parents. 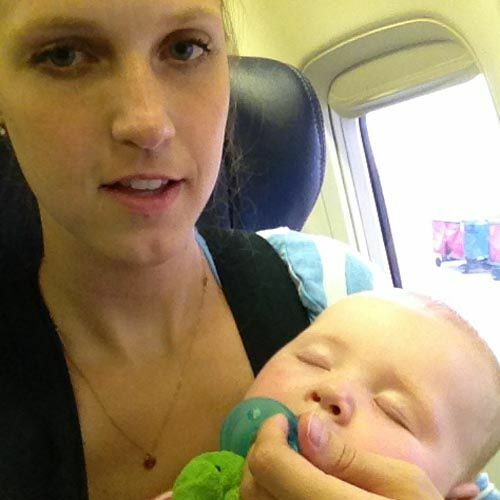 These wonderful tips will help moms everywhere relax a little and have a safe and enjoyable flight with their babies.